It was knocked out of its orbit into an elliptical orbit. It swung closer and closer to the sun. Then, last summer on June 2, it roared into Earth’s atmosphere at 40,000 miles per hour. This random chain of cosmic events landed it on the homeland of the White Mountain Apache Tribe in eastern Arizona. Now it has a name. The tribe has named their meteorite Dishchii’bikoh Ts’iłsǫǫsé Tsee. In English, it is Cibecue Star Rock. It was officially confirmed Monday. Recovered by an Arizona State University team during a three-day expedition, it is a meteorite like no other ever studied. 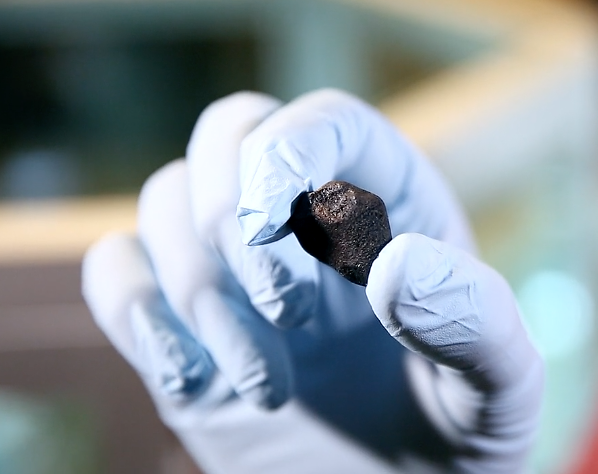 “It does contain things we have not seen before,” said Laurence Garvie, research professor and curator of the Center for Meteorite Studies in the School of Earth and Space Exploration. It is an ordinary chondrite — the most common type of meteor. However, when Garvie examined it in detail, he found some unusual features. It has been classified as an LL7 meteorite. Only 50 of that type have been found over the world. This is the first in North America. The name and classification were approved by the Committee for Meteorite Nomenclature, a 12-member international committee that classifies all new meteorites found around the world. The committee is part of the Meteoritical Society. They mull such questions as, is the name appropriate? How do you justify it being a certain type of meteorite? Is the science there? It’s a difficult and time-consuming process. The meteorite belongs to the White Mountain Apache Tribe, but it will be curated in perpetuity at the center on the university’s Tempe campus. Permission to curate the meteorite took months of legal work. Because the meteorite belongs to the tribe, they chose its name. “We wanted something that reflected the local environment and what’s special about it,” Garvie said. Jacob Moore, assistant vice president of tribal relations at Arizona State University, and tribal chairman Ronnie Lupe were key to securing permission from the tribe to search on their land.